It may not necessarily attract women (or men, come to that) but that doesn't stop a lot of men from wanting to know how to get big arms and build their biceps. They want their guns out, even now the sun's no longer out, at least in the UK. And indeed, when someone asks you to think of a particularly 'swole' individual, it is likely that Arnie's gargantuan cannons in Predator will spring to mind, rather than, say, Conor McGregor or a ballet dancer. Big, toned and defined arms (particularly bulbous biceps) have long indicated that an individual takes care of his or herself in the gym, perhaps because they tend to poke out of t-shirts and are generally on display more than, say, abs or legs. Because of this, many individuals fresh to the gym or new to the whole fitness game in general tend to focus on building big arms, which is totally fine if incorporated into a well-rounded workout routine. "Probably every guy I’ve ever trained has wanted to build up their arms," explains Keith McNiven, founder of London based personal training company Right Path Fitness. "From the forearms to the biceps, triceps and shoulders, these are the muscles that are right out on show when you’ve got your t-shirt on and the ones that shout strength and power," he adds. Well, you're in luck, because Keith is on hand to teach you how to dish out tickets to the gun show. The bottom line is, building muscle is an energy consuming process and your body is going to the need the correct fuel to not only get you through the workout, but to repair and heal the muscle fibres so they can grow. "If you’re not taking in the right foods, then you can do all the arm exercises you want but you won’t get bigger arms," explains Keith. "What your body will do is grab onto your carb reserves. The result can be an actual loss of muscle mass and probably the opposite result that you want," he adds. Getting nutrition right is key to fuelling your workouts and building muscle, so Keith recommends you should be aiming for around one gram of protein per pound of your body weight and 1.5 to 3 grams of carbohydrate per pound of your body weight per day. Eating the right foods is one way of achieving this, or you can supplement your diet with all manner of protein shakes, bars and snacks, which make it easier to get the right numbers on-board. You could also try a complete meal replacement system such as Huel. "With your nutrition right, you have the fuel you need for an intense arm training programme. Of course, if you’ve never trained before then jumping right into a muscle-building programme might not be for you, so always ensure you’re working at a pace and level that’s right for you and your fitness experience," he adds. To achieve impressive appendages, you're going to have to lift heavy weights, and that will likely mean investing in a gym membership or procuring a good set of dumbbells for use in the home. If you prefer to sit whilst hefting large lumps of metal, you should consider a weights bench, too. "You can start with a weight that you are comfortable with and increase this as your muscles get stronger," explains Keith. "But the low number of repetitions in this programme means you should be able to lift a heavier weight than you would with a higher number of reps," he adds. But don't go mad with your choice of weights, please. It needs to be something you can lift 30 times in total without failing, or doing yourself a mischief. Allow yourself 2 to 3 minutes between each set of reps, take at least one rest day after each workout, and work up the weight you're lifting oh-so-gradually. Also, work up gradually to doing all the exercises and sets in the following list. And don't worry if you never manage to do the whole lot in one go. This exercise is for your biceps, the muscle that ‘pops’ when you do the classic power stance. Grab a barbell – one of the long bars with weights at both ends, if you're a complete novice – stand upright and hold the barbell with your knuckles facing upwards. Start with the barbell against your thighs, knees slightly bent and slowly lift the barbell up towards your chest before taking it back down to your thighs in another controlled movement. Another good bicep exercise is the hammer curl. Grab two dumbbells, one in each hand, and stand upright with your arms against your sides and the dumbbells against your thighs pointing forwards. Then you’re going to keep your upper arm completely still as you raise the dumbbells up to your chest, keeping it at the forward facing position. Return the dumbbells to your sides in a controlled movement and that is one rep down, nine more to go (and then two more sets – hey, we didn't say this would be easy). 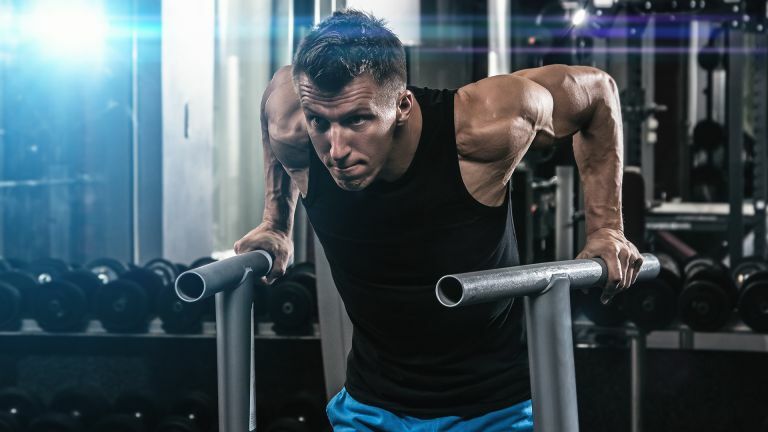 This exercise is great for developing the triceps, which are the muscles at the back of the arms and the ones that generally get wrongly overlooked when building bigger guns. You can use the cable pull down machine at the gym for this (or perhaps invest in a suitable home multi-gym if you're flush). Get the weight set on the machine that you’re comfortable with and grab that bar with elbows bent and knuckles facing upwards. Then you’re going to use just the triceps to lower the bar down to your thighs. Keeping your elbows in close to your body can help to ensure it’s your triceps that are taking the strain here. Then slowly return the bar from your thighs back up to your chest and the starting bent elbow position. Building bigger arms doesn’t only involve lifting weights, as bodyweight exercises can be very effective for training the triceps. Use a pull up machine and take your weight by lifting your legs behind you and using almost fully extended arms to hold yourself in position. From this starting position, you’re going to keep your elbows tucked in to isolate your triceps and lower yourself further down so that your almost straight arms bend at the elbow leaving a 90-degree angle. Then lift yourself back up. You can also work the same muscles outside of the gym by incorporating a home workout bench. Stretch your legs out in front of you, arms behind with palms flat on the bench surface. Lower the body keeping the same form as above and explosively push back up to complete a rep. This exercise covers the all-important forearms, another element that's important to well-rounded, balanced arms. Start standing upright with a dumbbell in each hand and flat against the front of your thighs, the dumbbell should be in a horizontal position and your knuckles should be facing upwards. Keeping arms quite close to the body, you are going to use your forearms to lift the dumbbells from your thighs and up towards your chest. Ease them back back down in a controlled movement. That’ll be one rep, then. You can also train your forearms with the cable machine at the gym. Again, set up the weight in a low position. With a straight back, hold the bar against your thighs with knuckles facing upwards. Then, slowly bring the bar upwards, contracting your biceps and using the forearm muscles to perform the exercise. Keeping elbows in close ensures it’s your forearms doing the work. You could also do this exercise with a barbell. Want workouts for the rest of you?